What If Bitcoin? The plugin helps you to Check how much you could have made by investing in Bitcoin. If you’re someone who has held Bitcoin for many years this could be very helpful. For the rest of us, it just reminds how much we regret not buying Bitcoin 5 years ago!Cryptocurrency is booming in the market and if you want to attract your readers then this plugin will surely help you to get traffics. Step 2: Configure look and feel of the plugin with Live Preview. Step 3: Just Paste the Shortcode what-if-bitcoin where you want to Display … that’s it. 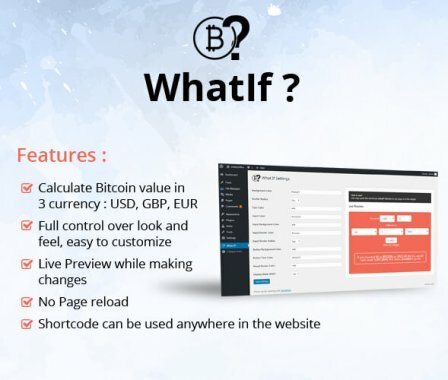 Shortcode what-if-bitcoin can be used anywhere in the website. More Currency added other than USD, GBP, EUR.